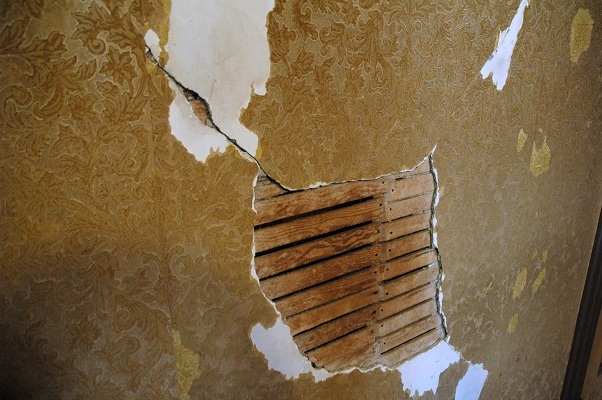 June 12, 2012 — There’s no compelling physical evidence for the existence of ghosts. But, man, is there some compelling physical evidence for people's belief in the existence of ghosts. 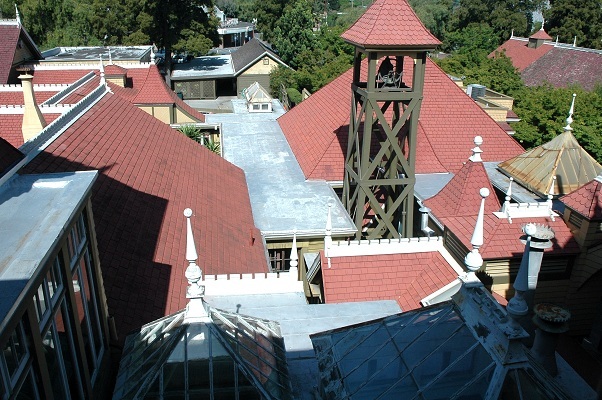 And the most fascinating of them all is the Winchester Mystery House. This is one of those oddities that everybody kind of already knows about, which is why I’ve put off writing about my visit there for so long (about three years, all told). 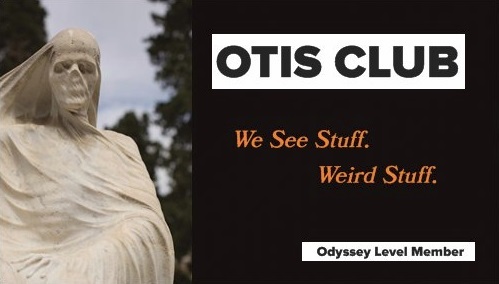 Still, the site feels incomplete if I don't have it on whichever of Google’s servers holds the power of life or death over OTIS. Here’s the story as quick as I can make it. 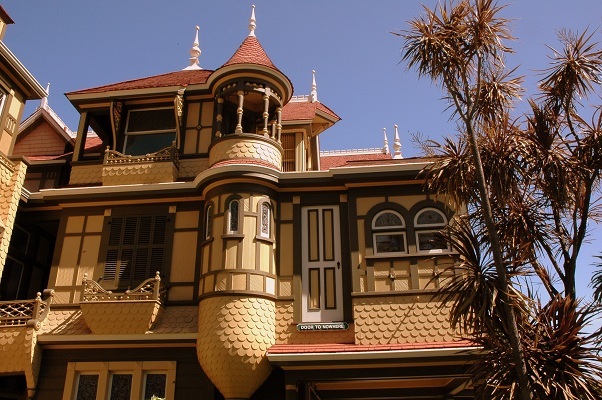 Sarah Winchester was a part of the famous Winchester family, the ones who made their fortune selling the iconic rifles that bear their surname. In 1881, at the age of 41, Sarah found herself widowed, childless…and extremely wealthy. The story goes that Sarah thought she was cursed and started to feel guilty at how the family made its funds, so she sought the advice of a medium. The dead told the tale that she should build a house to appease all the perforated victims of her family’s guns, and to never stop its construction else the ghosts of those victims would come after her. So real estate as life insurance. 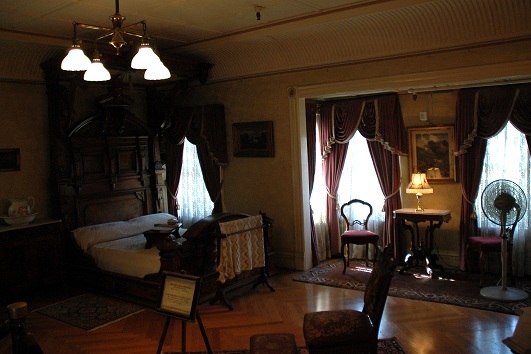 In 1886, she moved to California, bought an eight-room farmhouse, hired work crews, and then began a neverending construction that rabbit-bred those eight rooms into 160 by the time of her death. But it wasn’t just a neverending construction, it was a neverending nonsensical construction. 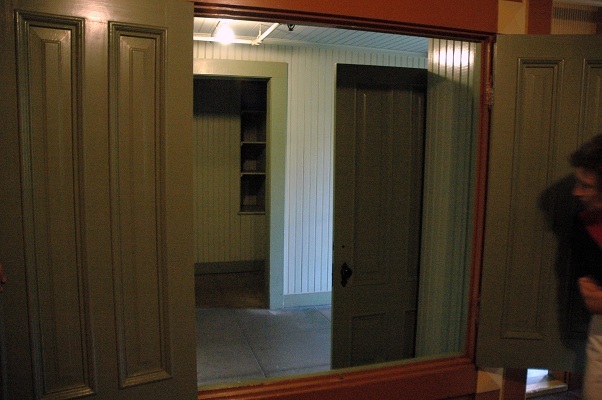 The mammoth mansion featured doors that led out into two stories’ worth of broken neck, windows set in the floor and in interior walls, cabinets that opened up into other rooms, stairs that stopped at solid ceilings. It was M.C. Escher‘s only ever architectural foray. Sarah died in 1922, peacefully in her sleep despite all the hammering and sawing. She was 83, and she left behind both her one-of-a-kind house and a whole lot of mystery. Some say that all of Sarah’s crazy construction was to confuse the ghosts. Others that it was at the behest of them, since Sarah conducted regular séances there. Whatever the reason, we have to assume it was a kooky one, since the evidence that attests to that fact stands to this day, and, most importantly for us, is open to the public. 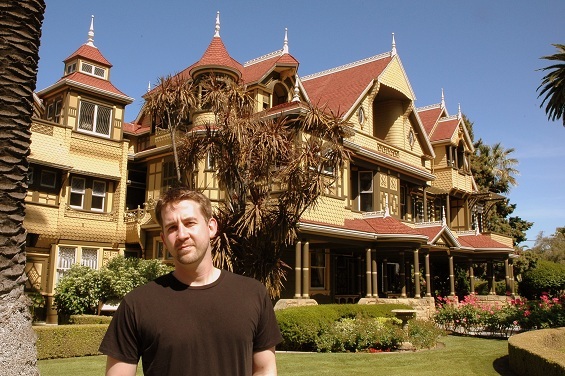 The house is located at 525 S. Winchester Boulevard, in San Jose. From the outside, it looks like what somebody might design if they were asked to build the opposite of a spooky house. It’s right in the middle of the city, boasts a bright yellow and red exterior, sits on a beautifully cultivated landscape, features prominent palm trees (the least scariest things in all of Creation), and is overall exquisitely well-kept in a place that rarely sees thunderstorms. However, the labyrinthine quality of the house more than makes up for the sunniness of its setting and appearance. Unfortunately, you can only go through the house with a guided tour, so you won’t get the thrill of being lost in a funhouse. Our tour group held about a dozen visitors, and out tour guide was a short, older man who kept calling Sarah the “Bill Gates of Her Time,” because of how she embraced cutting-edge domestic innovations. At the time, I thought the analogy was flawed, but Gates’ subsequent obsessions with the science of toilets have made me revise that opinion. Surprisingly, despite the fact that the entire attraction plays up the ghost angle of the house without apology and just about to the point of cheesiness, our tour guide actually tried to dispel it, saying that a more likely explanation was that Sarah was just bad at designing houses. 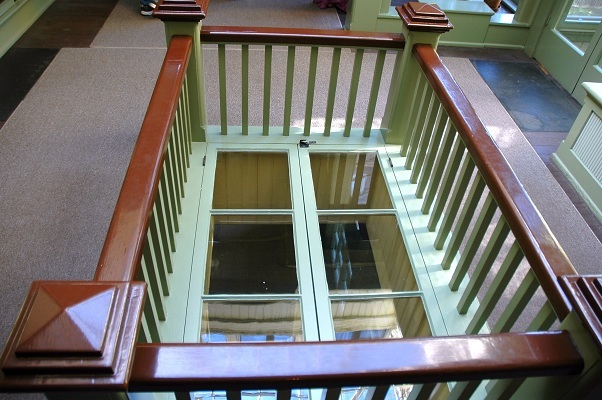 I guess, but a window in the floor? As we toured, the guide alternately pointed out features of opulence and lunacy, much of the latter of which I’ve already listed and the former of which is expected in the homes of the rich. 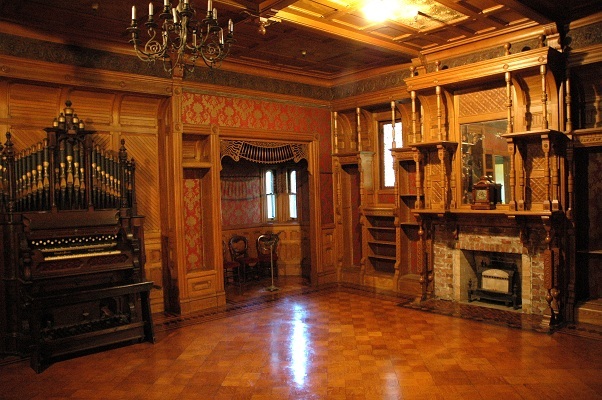 Of particular interest was her séance room, though, which was small, bare, and boring… so only of particular interest in that it was her séance room. Also, the section of the house that still retained damage from a 1906 earthquake that hit 8.3 on the Richter and shook the entire coast. Sarah got trapped in her bedroom for hours after it and, of course, took it as an omen from the spirits to direct her construction endeavors elsewhere in the house and to leave that part alone. Every once in a while, we passed a construction worker or two, since the edifice is always in need of maintenance. I don’t remember any of them being dressed in period garb or anything, but heck if they didn’t seem like the ghosts of contractors past. Once the tour was over, we were allowed to wander the grounds on our own recognizance, which besides the amazing gardens featured a small rifle museum and a large gift shop. Still, as interesting as the house and the story behind it are, a group tour seemed like a paltry experience with it. I want a night alone, or with one or two of my most impressionable friends, lost and wandering and letting our imaginations do scandalous things to us that we would only admit with a large book advance and a guest spot on Jimmy Fallon. 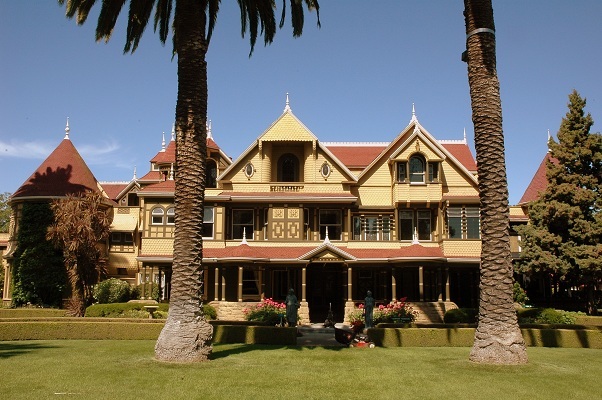 After all, every tourist attraction with some age to it claims to be haunted these days, but few have as big a claim as the Winchester House, whose very reason for existence is ghosts. Real or imaginary, doesn’t matter. Which is my take on the whole paranormal field, actually. Outside the "Door to Nowhere"
Oh, and I almost forgot. 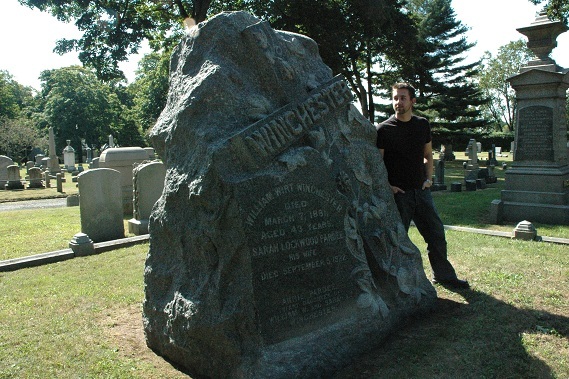 Sarah is buried on the opposite coast from her famous house, in New Haven, CT, where she was born. She's there with her husband and daughter in Evergreen Cemetery under a giant stone that doesn't give any clue at all to the way-cool thing she bequeathed us all.